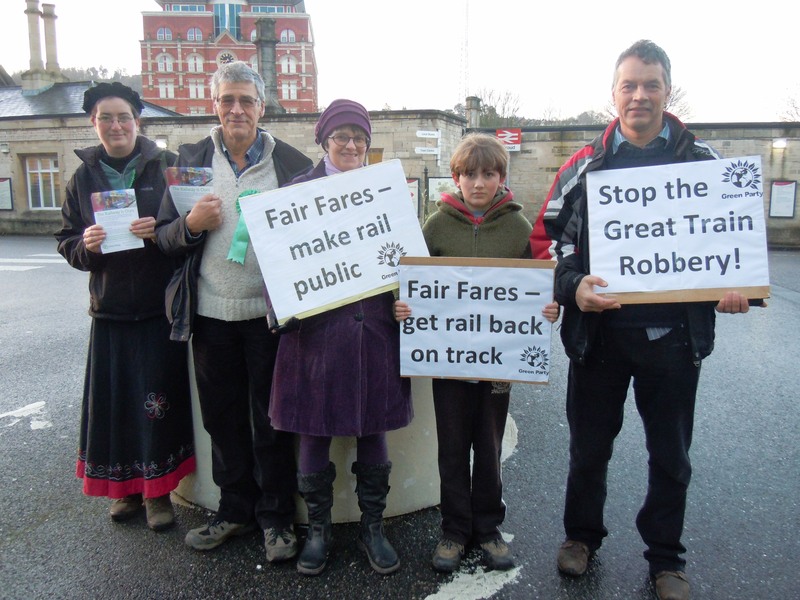 This morning I joined a handful of others outside Stroud train station to protest at the latest hike in rail fares and to call for the renationalisation of the First-Great-Western franchise. Why? Well, where to start. Figures show that the average rail season ticket in the UK has now risen to £2,191. This, put another way, is equivalent to 8% of the median UK salary. Even more depressingly, this is considerably higher than the £1,441 average fuel cost of driving to work. But it gets worse. There are sections of the UK rail network now where you pay as much as £6 a mile. The trains in the UK are bloody expensive. This is at least in part due to the last 20 years of privatisation. The Rebuilding Rail report put the cost of the privatisation of the railways at £1.2bn a year. Or again, put another way, enough money to cut the average rail fare by 18%. These ticket prices mean that for many trains are simply an unaffordable luxury. This restricts social mobility and also drives climate change as people opt for their own carbon intensive forms of transport. So, the question then is not why was I stood outside a station protesting but more why were you not stood with me? Never fear though…there is always something you can do. Write to your MP and ask them to support the recently launched Private Members Bill which, if adopted, “Requires the Secretary of State to assume control of passenger rail franchises when they come up for renewal”. The last 20 year tell us that governments are happy for train services to be run for private profit not the public good. It’s up to us to tell them that we want our trains running for the public good. Soon after publishing Molly Scott Cato, The Green Party lead candidate for the South West European Parliament elections, contacted me to highlight this e-petition – please do also sign the petition. Yep, i learnt to drive and got a car as I could no longer afford/ rely on the trains to travel to work or visit family. A return to London from Manchester during peak time is higher then my day rate. After getting the tube, I would make a loss for each day I worked in the city.